To specify the mask, double click the corresponding mask button (Viewport, Light, Intersection, etc.) and turn on required values from a 32-bit mask. Turning on a bit means setting 1 value (when turned off, the value is 0). The resulting mask (when the bit mask window is closed) is displayed as hexadecimal characters. Some masks store less than 32 bits. For example, the material mask. The masks are compared bitwise using binary operator and. As a result, the first bit of the first mask is compared to the first bit of the second mask, the second bit - to the second one, and so on. If two masks have at least one matching bit, the masks match. Values of other bits won't influence the result. Object surface viewport mask (set in the Viewport Mask field in the Node tab of the Parameters window). 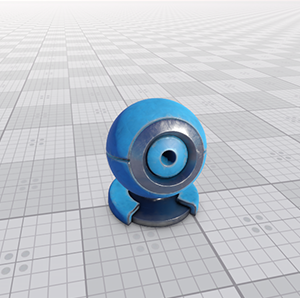 Object material viewport mask to render the object's material (set in the Viewport mask field in the Common tab of the material editor). All masks match each other by default. Suppose we have two objects with the same material. To make one of them to be rendered into viewport, and the other one not to be rendered, we need to change its viewport mask. A reflection mask controls rendering of environment probe's and planar dynamic reflections into the camera's viewport. For environment probes, in the Reflection mask field in the Environment Probe tab of the Parameters window. The mask is available only when dynamic reflections are enabled for the environment probe. For planar reflections, in the Mask field on the Parameters tab of the selected material. A reflection mask of the camera (set in the Reflection field of the Camera Settings window). A viewport mask of the object (set in the Viewport mask field in the Node tab of the Parameters window). A viewport mask of the object's material (in other words, the reflected material; set in the Viewport mask field in the Common tab of the Parameters window). Suppose, you have a reflecting surface and 2 objects reflected in this surface. 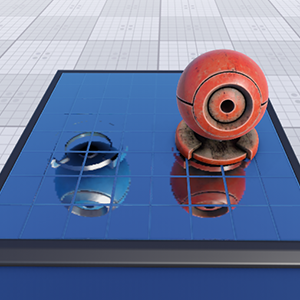 To render an object without a reflection, either its viewport mask or its material viewport mask should not match the camera's reflection mask. To render a reflection without an object, its viewport mask or its material viewport mask should not match the camera's viewport mask. In the example below, masks are given in the binary representation. For masks to match, they should share 1 in the appropriate bit position. You can convert these masks to the hexadecimal number representation and set the obtained values via UnigineEditor. 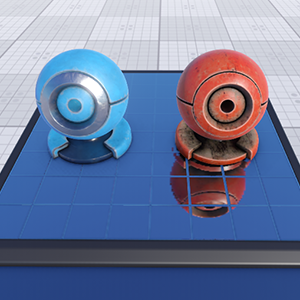 In the 1st example, the object's viewport mask doesn't match the camera's reflection mask. 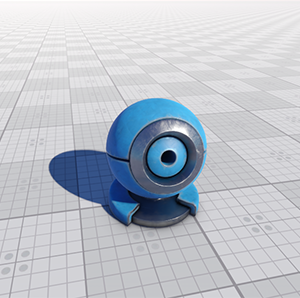 However, it matches the camera's viewport mask, so the object is rendered. 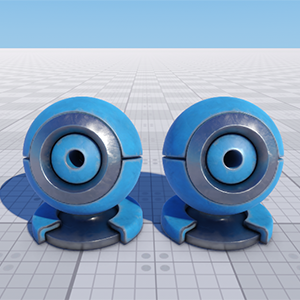 In the 2nd example, the object's viewport mask doesn't match the camera's viewport mask. However, it matches the camera;s reflection mask, so the reflection is rendered. A shadow mask controls rendering of a shadow cast by an object lit by a light source. 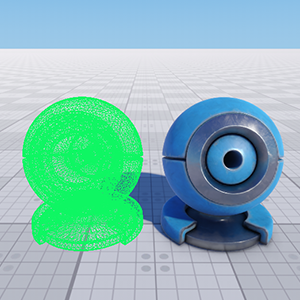 Object surface shadow mask (set in the Rendering field of the Surfaces section in the Node tab of the Parameters window). 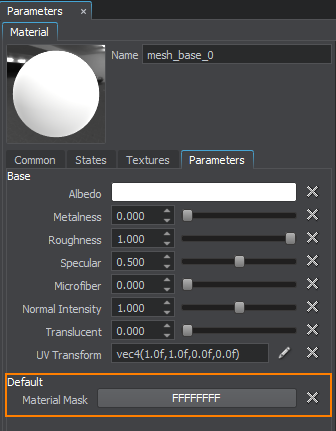 Object material shadow mask (set in the Shadow mask field in the Common tab of the material settings section). In the example below, the shadow mask of the surface and its material doesn't match the light mask of the light source so the shadow isn't rendered. Decal mask was renamed Material mask. A material mask is a 24-bit mask that specifies objects, onto which the decal can be projected. An object or one of its surfaces can receive the decal only if its material mask corresponds to the material mask of the decal. An intersection mask specifies objects (including objects, nodes, shapes, collision objects and obstacles) for which intersections will be/won't be found. An intersection is found only if the object's intersection mask matches the intersection mask passed as a function argument, otherwise it is ignored. The mask for the object can be specified via both UnigineEditor or API. The intersection mask can be used to clarify the object search or to increase performance by limiting the number of objects that can participate in intersections. A collision mask allows you to filter particular shapes and bodies for physical interaction: only those will collide, that have a matching collision mask. If the masks do not match, shapes and bodies will simply ignore each other by going through. A physical mask is a bit mask that filters objects interacting with physical nodes: force, wind and water. It is set according to the same principle as Collision mask. For example, body with unmatching mask placed in the physical water will not float. Masks can be set via both UnigineEditor and API. A source mask is a bit mask that determines to what sound channels the sound source belongs to. For a sound source to be heard, its mask should match with the player's sound mask in at least one bit. A reverb mask is a bit mask that determines which reverberation zones can be heard. For sound to reverberate, at least one bit of this mask should match the player's reverberation mask. At the same time, the reverb mask of the player should match the reverb mask of the sound source (but not necessarily in the same bits). A naviagtion mask is used to specify navigation areas that participate/don't participate in pathfinding. The navigation mask must match the navigation mask of the route that is calculated within the navigation area. Otherwise, the area will not participate in pathfinding. Via UnigineEditor in the Navigation Sector/Navigation Mesh tab of the Parameters window. The navigation mask of the route can be specified only via API. Using the navigation mask, you can limit the number of navigation areas, inside which the specific route can be calculated. For example, you can use the mask to calculate 2 non-intersecting routes inside the intersecting navigation areas. An obstacle mask is used to specify obstacles inside navigation areas that are bypassed/aren't bypassed during pathfinding. The obstacle mask of the obstacle must match the obstacle mask of the route that is calculated. Otherwise, the obstacle will not be taken into account. Via UnigineEditor in the Obstacle Box/Sphere/Capsule tab of the Parameters window. The obstacle mask of the route can be specified only via API. A field mask specifies an area of the field to be applied to grass or water. The field will be applied to grass or water only if they have matching field masks. The field mask can be set via UnigineEditor or API.